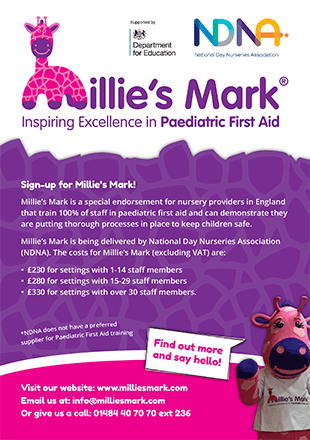 Millie's Mark does not have a preferred supplier for paediatric first aid. Childcare settings are free to choose a provider of their choice. 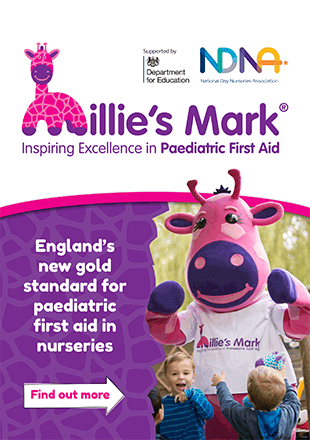 However, awarding of Millie's Mark will indicate strong delivery of paediatric first aid training and paediatric first aid understanding. In England only the course content of the full (2 day) paediatric first aid training course and content of the emergency (1 day) paediatric first aid training must cover the elements that are prescribed in the revised EYFS 2017. Further information about the content can be found here. Childcare providers will be assessed about how they have carried out due-diligence on training providers to ensure the above is covered. If you have any questions about Millie's Mark visit the FAQs page for a breakdown of common questions. 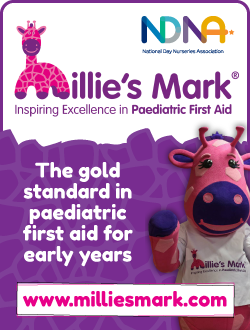 Click on the flyers below to download them, and share with your training delegates to raise awareness of Millie's Mark. Click on the adverts below to download them. These can be used to promote Millie's Mark on your website.